Welcome to another Christmas season at County H Tree Farm. There is a nice selection of trees including the "natural"ones, the old fashioned Christmas trees that were popular in the past. If you prefer the hand sheared more perfect trees, those are also available along with the unique "Charlie Brown" trees. A new stand of cedar will be available this year. Species available, cut or pre-cut, include balsam fir, blue spruce, white spruce, white pine, and cedar. All the trees are $30, any size or type, except for the $10. "Charlies" (which are pre-cut and we select). There will be bundles of boughs and red willow whips available for your holiday decorating. We will be making fresh green kissing balls as in the past along with fresh green wreaths, all made daily. Wreath sizes range from 12 inch candle ring to 42 inch, 50 inch (best to order in advance) and a 62 inch (available by order only). Sizes and prices are on our products page with no increase in price from last year. As in the past, we will deduct $2. when purchasing a fresh wreath along with a tree (some exclusions apply). Our gift shop is taking shape with the new snowmen, Santas, angels, ornaments, and decor as well as holiday gifts and gift baskets. The very popular handmade wool mittens will again be for sale in the gift shop and you never know what other crafters we will have! Children and grandchildren, bring your letters to Santa to deposit in his mailbox by the Christmas gift shop. Check out our "Specials" page on the website for more details and specials. This year we will be donating a portion of our tree sales to the Door County Canine Unit. And, of course, the best p﻿art of the day is sipping free hot chocolate by the 'ole pot belly stove in the gift shop after you are finished getting your tree. Free candy canes to all good children (and adults, too). So please join us again this year, have some fun, and create wonderful memories by coming out to the tree farm and picking out the best Christmas tree! Pets are welcome in the tree farm as long as they are under your control. REMEMBER - WE WILL NOT BE OPEN ON THANKSGIVING WEEKEND! WE WILL BE OPEN FRIDAY, SATURDAY & SUNDAY, NOVEMBER 30, DECEMBER 1, 2, 7, 8, 9, 14, 15, 16. We will not be open after December 16th. Hours are 8:30 am til 4:30 pm. The Future! 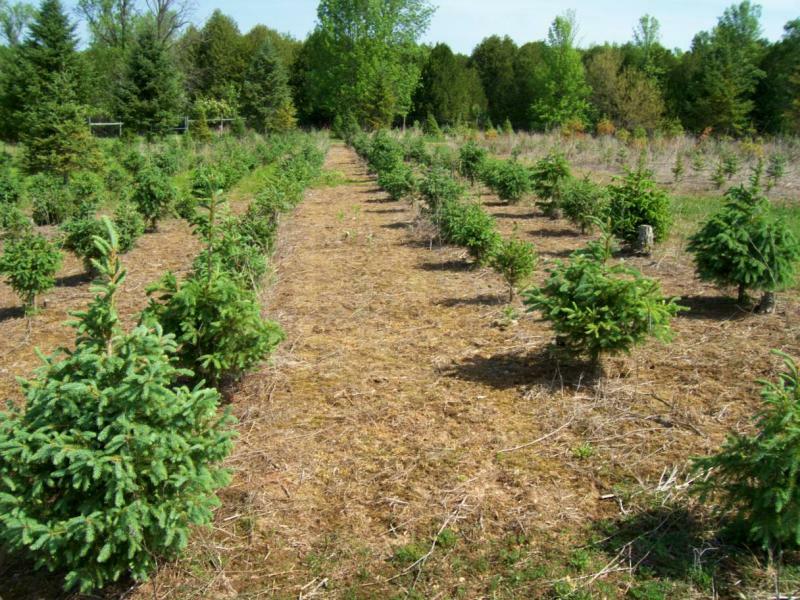 We have thousands of trees that are growing and will be available in years to come.